The CT-250 Mini Tracker is designed for a variety of covert tracking operations, and features sleek, custom, covert casing. This state-of-the art GPS tracking device reports exact location, speed and battery level of the tracker, all in real time.The CT-250 can be used anywhere in the world, providing perfect asset management, personal safety and covert tracking abilities. You can activate your device through the Eye Spy Supply Activation Page. Not only will this waive your activation fee, you will receive 5% off of any future orders with Eye Spy Supply! Call our sales team for more details. Internal rechargeable battery lasts for approx. 12 hours of actual motion (up to 15 days). Custom covert casing for expert concealment. 1 month Free with one year prepay. How The CT-250 Tracking Device Works. 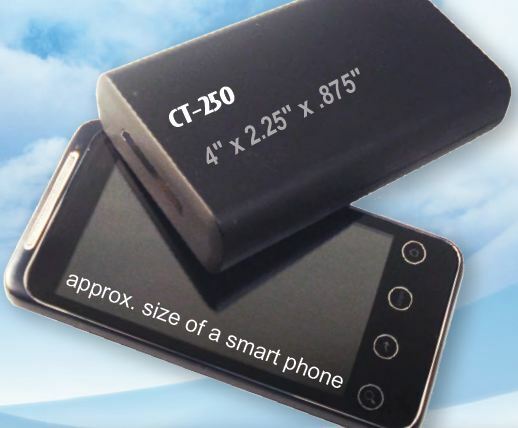 The CT-250 GPS tracker can be placed on or in a vehicle or asset that you want to track.